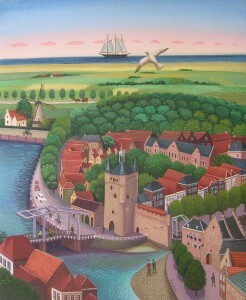 Nadia Becker was born in 1939 in Brussels, Belgium. She studied graphic advertising, Academy of La Cambre in Brussels, Belgium in 1957 and began her artistic career in 1975. She has participated in solo exhibitions as well as group exhibitions throughout Brussels, Charleroi, Lasne, Liege, Huy, Diest, Waterloo, Paris, Bordeaux, Amsterdam, Rotterdam, Nuenen, Geneva, Morges, Munich, Stockholm, Chicago and Caracas.